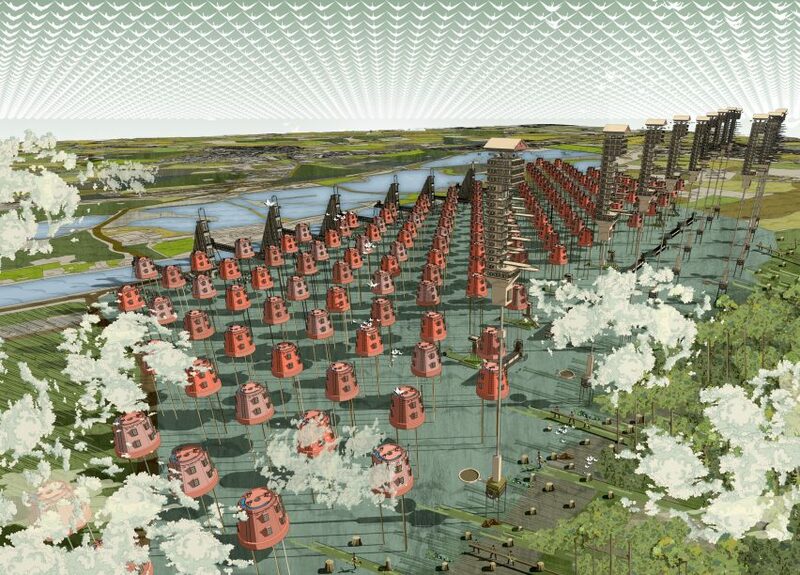 Bartlett School of Architecture graduate Damien Assini has proposed that the UK government reallocates funds from the proposed HS2 railway, and instead creates a natural landscape incorporating carbon-free modular housing and a green economy. Assini's project is called Re-imagination of the HS2, and is based on skepticism uncovered in his research about the potential benefits of the high-speed railway linking London with the Midlands. In particular, criticism in the Guardian newspaper of this costly infrastructure project prompted Assini to develop an alternative proposal that involves transforming the route of the HS2 into a green corridor accommodating housing and sustainable businesses. "Using the HS2 as a case study, the project aims to suggest an alternative construction of 'a country that works for everyone' – a blueprint for change in the context of ongoing national uncertainty," said Assini. "The design narrative materialises directly from the difficulties the UK faces. It drafts a masterplan for a sustainable urban framework, crafting a system of symbolic architectonic infrastructures." Rather than going ahead with the sort of vast infrastructure project that he feels could result in "gentrification, displacement or loss of existing city heritage," Assini's speculative proposal focuses more on local needs. The land currently designated for the railway would be transformed into a landscaped urban masterplan aimed at creating a "green knowledge economy" that promotes nature, sustainability and inclusive wealth. The first 25 years of the project would see an enormous plantation comprising local woodland, farmland and wetland extend along the route, creating habitats that would allow fauna and flora to spread across the country. Towns featuring carbon-free modular houses would be constructed in stages along the route, according to local demand and with special care taken to balance out any regional funding inequalities. Mobile "education lodges" also feature as part of the proposal, offering vocational training and enabling the schooling system to shift location in order to fulfil regional demand. An important source of building materials would be provided by the implementation of a tree-management programme, with timber used to create essential infrastructure including housing, schools and hospitals. Waste-management facilities would utilise anaerobic digesters to recycle organic waste and generate green energy. The student chose to communicate the speculative narrative of his proposed scenario using a combination of hand-drawn illustrations and computer-generated models. Ultimately, Assini sees his project as a way for post-Brexit Britain to establish itself as a global leader in the shift towards a zero-carbon economy, and to demonstrate new ways of generating employment and growth. "By reinforcing heritage and creating a new cultural green trading infrastructure across Britain, the route will aim to teach true values of Britishness through nature, local resources and craftsmanship," he concluded, "balancing environmental, social and economic issues." Assini completed the project as part of his studies on the Bartlett School of Architecture's Unit 10 programme, which is led by Simon Dickens and CJ Lim. It was presented at the school's summer show, which took place between 24 June and July 8, and also featured a proposal for a modular construction system based on I-beams, and a masterplan for a new Chinese cultural capital.